Please feel free to contact us for any queries you have and we will get back to you as soon as possible. For a specific enquiry please direct it to a member of our team below. Drive 35 km from East London on the N2 in the direction of Durban. Turn right down the R349. Drive for 35 km on tar, and then turn right. 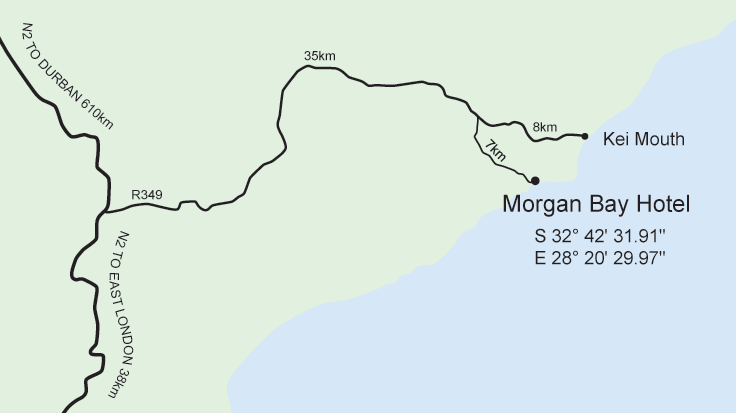 Drive for a further 6 km and you will reach Morgan Bay. Please note: Turn right at the first Morgan Bay turn off, which is just after the white 'Eish' aeroplane on your right. Most GPS devices will direct you past this turn off and make you enter Morgan Bay via the Link Road, which is a gravel road that is in a terrible condition. Morgan Bay has a small, well maintained 600m grass landing strip called Brown's Landing, for those who intend flying in themselves. Transfer arrangements to and from the hotel can be arranged.